Pack Your Passport, Baby: Bath time! My son loves his pre-bedtime bath, and we try to maintain his routine as much as possible when we travel. Often we find ourselves without a bath tub, so we've used sinks and several inflatable options. 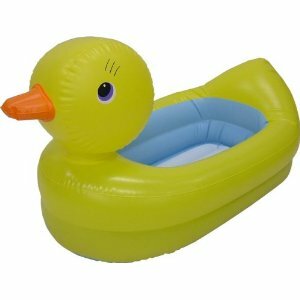 The Munchkin Inflatable Safety Duck Tub was the first inflatable tub we purchased and it proved very handy. The inflated size is 31" x 19" so it fit well even in tight shower stalls and it was lightweight at 1.6 lbs. It deflated and folded easily and B enjoyed the duck shape. (If you press the beak, it quacks!) It even features a built-in patch that turns white when the water was too hot. The manufacturer recommends this tub for babies between 6 and 24 months, but it became a bit too narrow for B when he was about 12 months old. 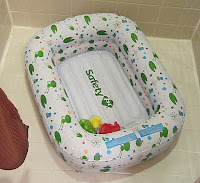 Of the tubs I have reviewed here, this one is the most suitable for babies who cannot sit up unassisted - when he was very small, we put B in sideways so he had little room to slide down. The next tub we used was actually an inflatable pool - Intex's My First Baby Pool. I loved this one because it was even lighter, at only 1 lb and folded up even more compactly the the other options noted here. With a 24" diameter, it still fit in tight shower stalls (even cruise ones) and gave B lots of room to splash around. We had to stop using it after several trips when it got a hole (my fault not the manufacturer's), and I found it very hard to replace when I needed it - in winter. 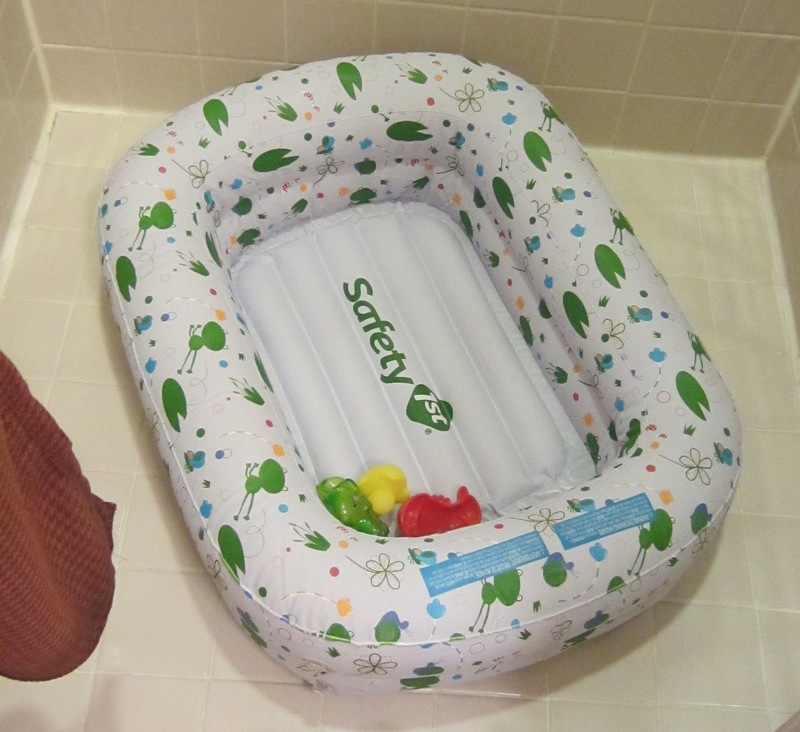 That's when I bought our third tub, and now my favorite - The Safety 1st Kirby Inflatable Tub. It is recommended for babies over 20 lbs. The inflated size is 28" x 21", it folds up easily and weighs only 1.4 lbs. My only fault with this tub is I found it difficult to inflate and deflate (the valves don't let much air in/out), so it is definitely best suited to holidays where you can leave it inflated for a few days, rather than having to inflate/deflate it on a daily basis. Please note - I have included links to Amazon for all these tubs, as I find it a helpful starting point for price comparisons and often contains the most comprehensive product descriptions. I do not receive any commissions or kick-backs from purchases of products from their website.